What are the normal and healthy values for a mature female without a pregnancy? The reference ranges chart define the healthy limits of complete blood cells count for women. Values in this chart are considered safe for a women only if she’s no pregnancy episode. Estimating the normal limits of women blood cells help in predicting early blood related diseases and cancers as well as bacterial or viral infections and follow up treatment effectiveness. What is the healthy normal ranges for a woman CBC test? As listed in the reference ranges table, hemoglobin levels must not exceeds 16 grams per deciliter blood, and must not be less than 12.0 grams per deciliter of blood, less than 12. means anemia. RBCs count of 4.0 to 5.2 million cells per microliter of blood represents healthy red blood cells count exclusively for the woman which is normally less than normal RBCs count for a man when compared to man’s CBC normal values. Women exhibit low hemoglobin levels during period cycle due to blood loss through menses, which is not a normal low level of hemoglobin and require a treatment. Also, high WBCs count than normal limits usually seen in women due to Urinary tract infection, which is not a normal count and need medical treatment and follow up. A free answering for your questions became easy through comments, Fb Page, or Ask page. 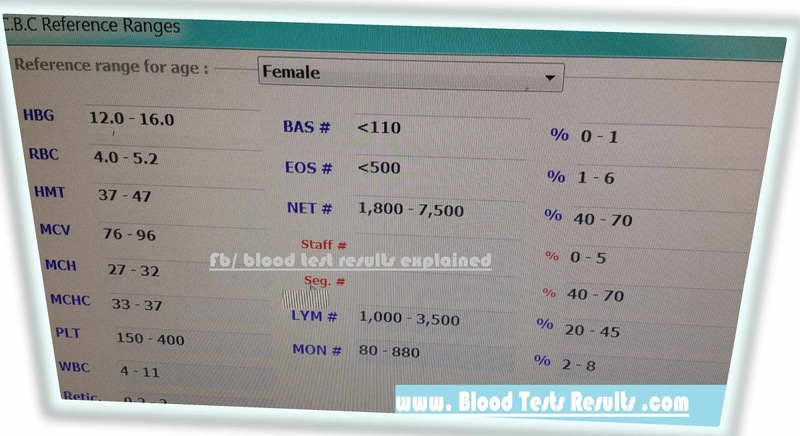 What Does MCH Blood Test Mean in CBC test?